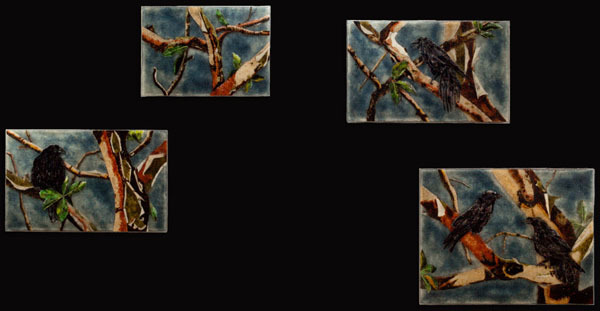 The fine art wall pieces are sets of multiple glass panels from 9 to 50 plus square feet. Some animals depicted to date include: cougar, great blue heron, gray wolves, tiger, giraffe, cheetah, snow leopard, African lion, African elephants, zebra, moose and trumpeter swans. Multiple layers and multiple firings make this work appear three dimensional in a vitreous painting. Initially the pieces were mostly portraits but have evolved into paintings encompassing animals in their landscapes. Corvus corvax – The Raven Clan of the Madrone.